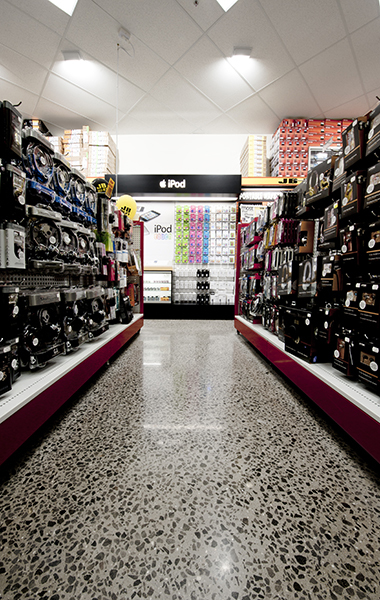 Pro Grind’s mechanically polished concrete floors continue to deliver JB HiFI flooring solutions which offer durability, maintenance and design advantages; enhancing the customer purchasing experience whilst meeting performance and cost demands of tenancy owners. 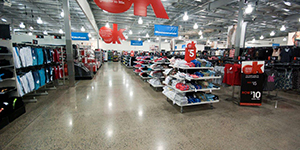 JB HiFi at their recent Oxley Qld WOW store conversion, contracted Pro Grind to refurbish and polish the concrete of the 1500m2 trading floor. Refurbishment works included removing glue and 20mm thick leveling compound remaining from the previous floor coverings of vinyl tiles, timber and carpet. 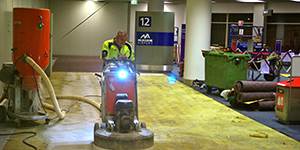 With the challenges of thick leveling compound Pro Grind effectively deployed new diamond tooling specifically designed to tackle leveling compound, and doubled the resources allocated to the project, ensuring that the project was delivered ahead of schedule; reducing time and project costs for JB HiFi. JB HIFi congratulated Pro Grind operators on an outstanding delivery of a challenging project and for enabling JB HIFi to continue with their refurbishment works without delay, further cost or inconvenience. FAQ’s: How many layers are on your floors? You're receiving this because you're on the ProGrind Newsletter list. Not interested anymore? Unsubscribe.